Press the “SETUP” button while the vehicle is stopped. The “Custom Settings” screen is displayed on the multi-information display. If left idle for approximately 10 seconds, the display will revert to the previous screen. Select the setting you wish to change by pressing the “INFO” or “SETUP” button, and press the “SELECT RESET” button. If you select “Exit” and press the “SELECT RESET” button, the display will revert to the previous screen. The illustration assumes that “Door” was chosen in . The current setting is indicated by yellow text. If you select “Return” and press the “SELECT RESET” button, the display will revert to the “Custom Settings” screen. 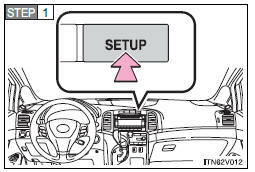 Choose a desired setting by pressing the “INFO” or “SETUP” button, and press the “SELECT RESET” button. If any settings are changed, the display will revert to the previous screen. 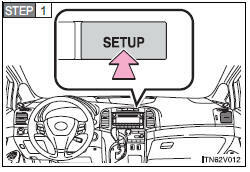 The illustration assumes that “Auto Locking” was chosen in . If you select “Return” and press the “SELECT RESET” button, the display will revert to the previous screen. Select “Default Settings” by pressing the “INFO” or “SETUP” button, and press the “SELECT RESET” button. Select “Yes” by pressing the “INFO” or “SETUP” button, and press the “SELECT RESET” button. “Default Settings Restored” is displayed, and the default settings are restored. If you select “No” and press the “SELECT RESET” button, the display will revert to the “Custom Settings” screen without restoring the default settings.